In the kitchen and dining areas, the richness and elegance of dark brown timber-look floor tiles perfectly sets off brightly painted cabinetry. 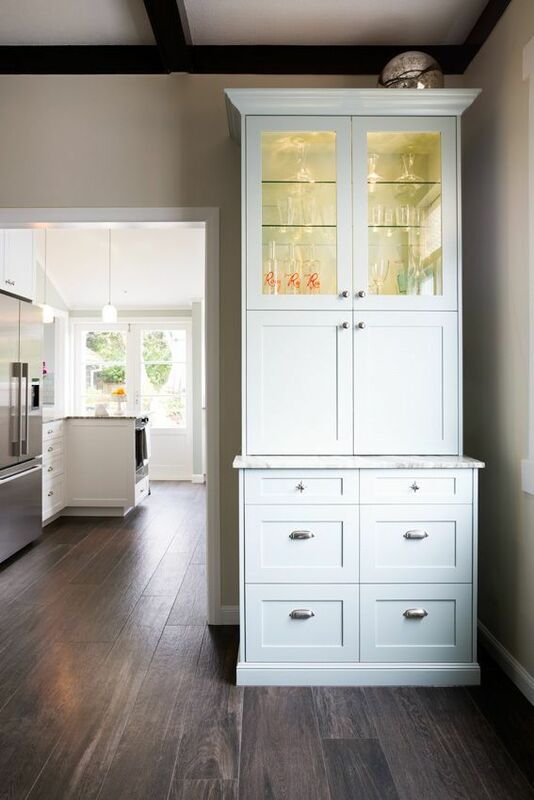 Custom dining room cabinets, painted the same colour as the kitchen walls, compliment the adjoining kitchen and offer loads of great practical storage. The unique and exceptional bar area glistens with jewel-like recessed lights that shine through glass fronted cabinet doors. The splash back is an antique’d mirror and opposite is a hutch with deep drawers and more glass cabinets, a pefect place for storing all that lovely serving ware. In the bathroom and powder room, polished nickel tapware and porcelain sinks of the finest quality are showcased. Everything in these rooms is fine tuned to evoke an old world elegance that perfectly suits this lovely home, and it’s cultured occupants.